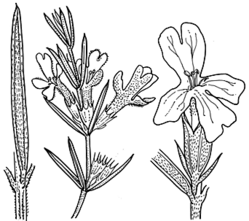 Westringia eremicola A.Cunn. ex Benth. Description: Shrub to 1.5 m high. Leaves in whorls of 3 or rarely 4, lamina narrow-elliptic to linear, usually 8–20 mm long, 0.8–1.6 mm wide, length to breadth ratio 6–20, margins entire and recurved, often such that lower surface almost concealed; both surfaces moderately to densely hairy with ± appressed, simple, antrorse hairs; petiole 0.5–0.7 mm long. Bracteoles 0.8–2 mm long. Calyx green, outer surface densely hairy; tube 2.5–4 mm long; lobes triangular, 1–3 mm long, 1–2 mm wide; lobe to tube ratio 0.3–1.3. Corolla 6.5–8.5 mm long, lilac, mauve or purple, rarely white, usually with orange to brown dots. Distribution and occurrence: Grows in mallee in sandy soils or (var. Other Australian states: Qld Vic. S.A.